If you have coronary artery disease, the arteries in your heart are narrowed or blocked by a sticky material called plaque. 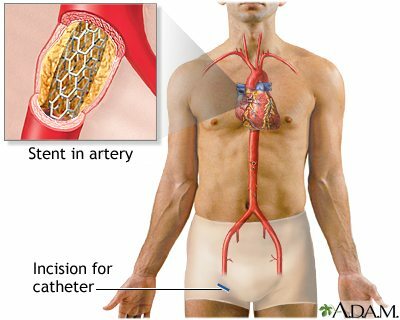 Angioplasty is a procedure to restore blood flow through the artery. You have angioplasty in a hospital. The doctor threads a thin tube through a blood vessel in the arm or groin up to the involved site in the artery. The tube has a tiny balloon on the end. When the tube is in place, the doctor inflates the balloon to push the plaque outward against the wall of the artery. This widens the artery and restores blood flow. Many people go home the day after angioplasty, and are able to return to work within a week of coming home.